Gwendolyn Coyne, from Elmo, Utah has been the newest and most improved player on the CEU tennis team said Coach Ron Vogel. Her teammates all agreed that since the first practice, Coyne has had a motivating, happy, hard working attitude. She comes from family of five kids. Her older sister played tennis and is the one who got Coyne started in the sport. Her sister became her motivation and her support throughout her tennis matches and career. 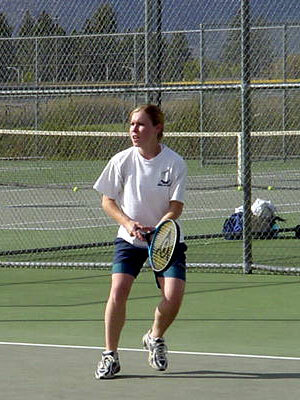 Coyne played all four years on the varsity tennis team at Emery High School. She was awarded ‘Newcomer of the Year’ as a freshman and ‘MVP’ the next three years. She played both singles and doubles on her high school team as well as at CEU. Coyne played in the women doubles bracket with Lindsey Arnoldis, together they took first place. As the number three women singles player on the CEU team, Coyne took second in the women singles bracket. “She was a really talented player when she first joined the team and has only improved. She has more dedication to the sport than most of the players on our team. She has self discipline and I think that if she keeps it up and keeps improving she is going to do really well,” Cameron King commented. Coyne grew up close to CEU and always planned on coming here. When she received a scholarship, she accepted and made the decision to move to Price and attend. “My favorite thing about playing tennis for CEU is not only my teammates, because they are all so fun to play and practice with, and spend time with but to be able to play at a competitive level again. I wasn’t sure if I would be able to play at such a level after high school again so I am so happy I got this chance and opportunity. It has been a really great experience. “The other people on the team are great competition in practice and are such amazing people. They have really made this tennis year fun for me and really worth-while. “My favorite experience on the team thus far was at the last tournament we attended. It was at SLCC and I got to play quite a bit. I feel like I did really well against the other teams. They had some amazing girls but I played really hard,” Coyne commented. Teammates said that Coyne is a humorous girl, always doing things to make them laugh. She is constantly hitting people on the other team and at the last tournament Coyne was playing doubles and hit one of the girls on the other team. The ball hit her on the head and she stumbled and fell over backwards. Coyne felt awful about it but everyone else got a good laugh out of it. Coyne is majoring in physical therapy and would like to attend either the University of Utah or University of Nevada Las Vegas. “I would love to play tennis for a university, but I need to get better before that happens,” she said.